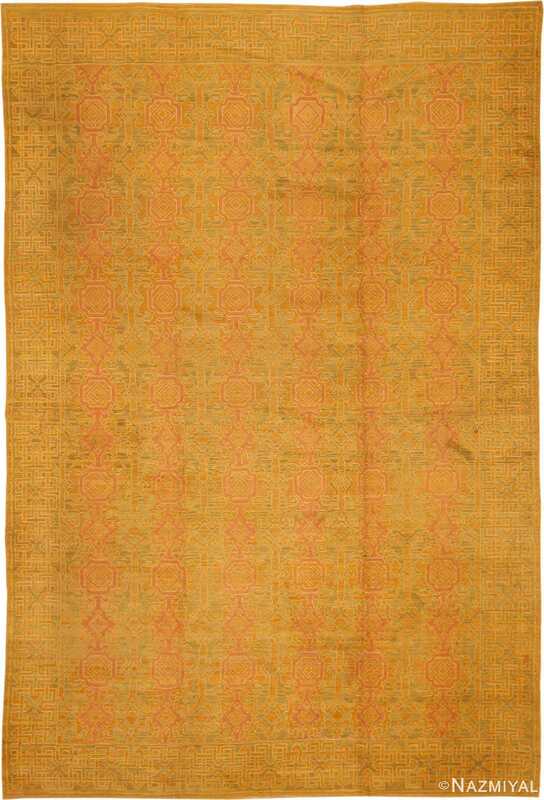 This splendid Spanish 17th century carpet is from the influential textile producing city of Cuenca displays a marvelous convergence of European and Eastern design traditions that are remarkably old. 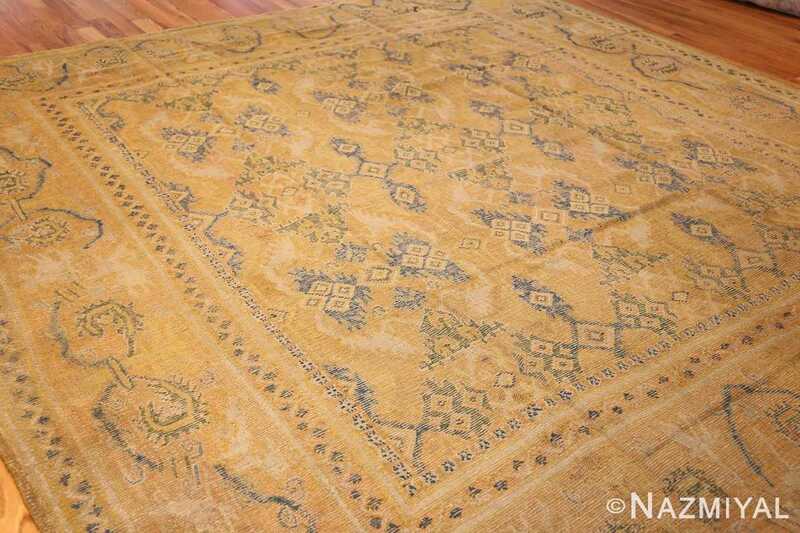 In the typical style of the era, this magnificent antique Spanish carpet displays a simplified tiled repeating pattern executed in a low-contrast color palette comprised of earthy ochres, mineral greens and elegant sapphire blues that are balanced by ivory accents. 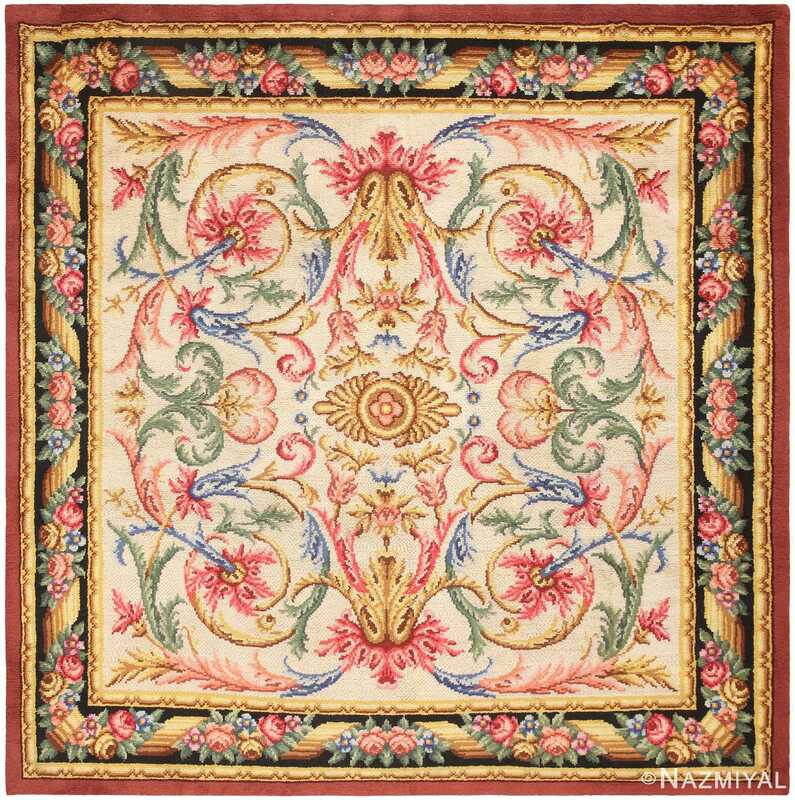 The traditional Spanish Cuenca rugs style of borders display a pattern of reciprocating vine scrolls tied together in fleur de lis fashion and laden with botanical flourishes and spiraling tendrils. Within the elegant gilt-tone field, geometric diamonds, turtle-like figures and semicircular leaflets form architectural tiles that are reminiscent of Persian Herati rug design motifs but have lost their characteristic appearance and gained an air of European formality unique to 17th century Spain. 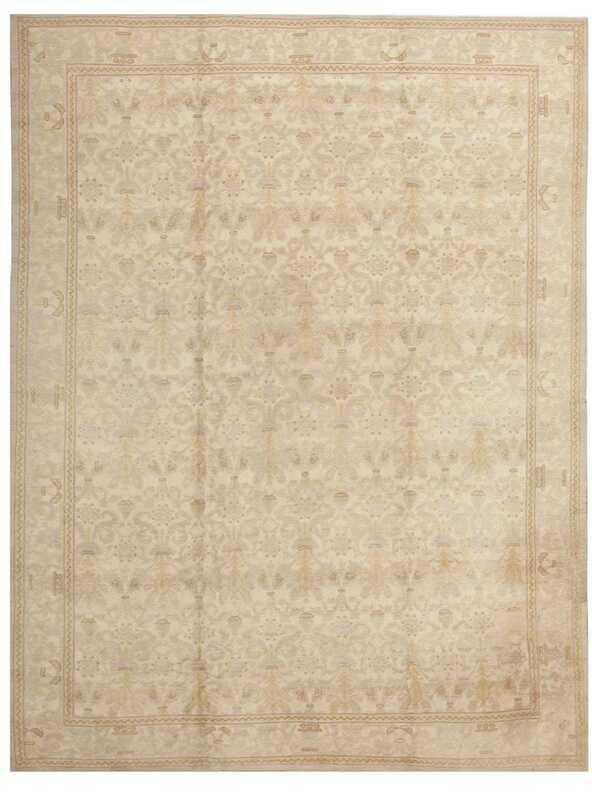 A Magnificently Breathtaking 17th Century Spanish Cuenca Carpet, Country Of Origin: Spain, Circa Date: 17th Century – This elegant early rug from the carpet works at Cuenca, Spain demonstrates several characteristics that make it an excellent example of carpets from the 17th century. 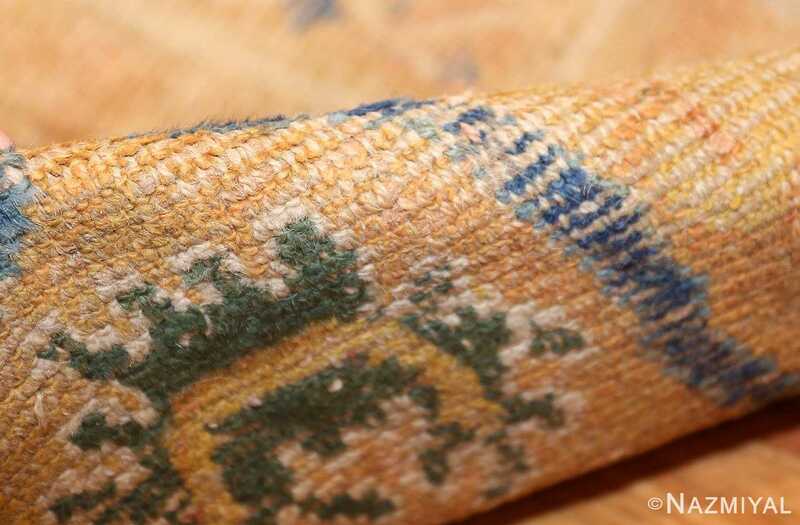 By that time, Cuenca was established as one of two carpet weaving centers in Spain. Antique Spanish Cuenca carpets were known to be heavier and courser than those woven in Alcaraz. 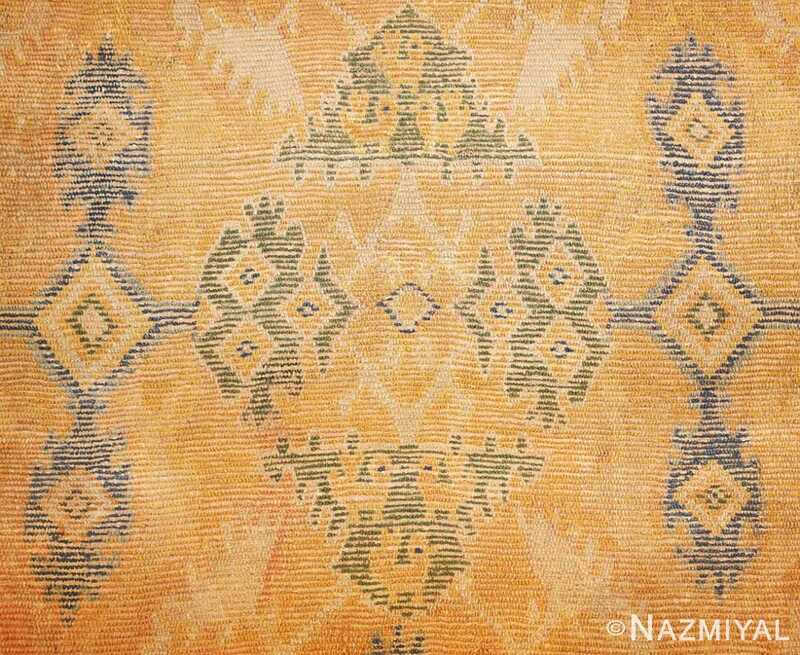 Perhaps the most significant feature of this soft and beautiful antique rug is that it demonstrates the influence of 700 years of Islamic occupation in Spain. The decidedly Moorish influence of this antique Spanish carpet can be seen in its formal borders and tiled, geometric field. The design of the field is not centered and is offset both horizontally and vertically from the center of the carpet. 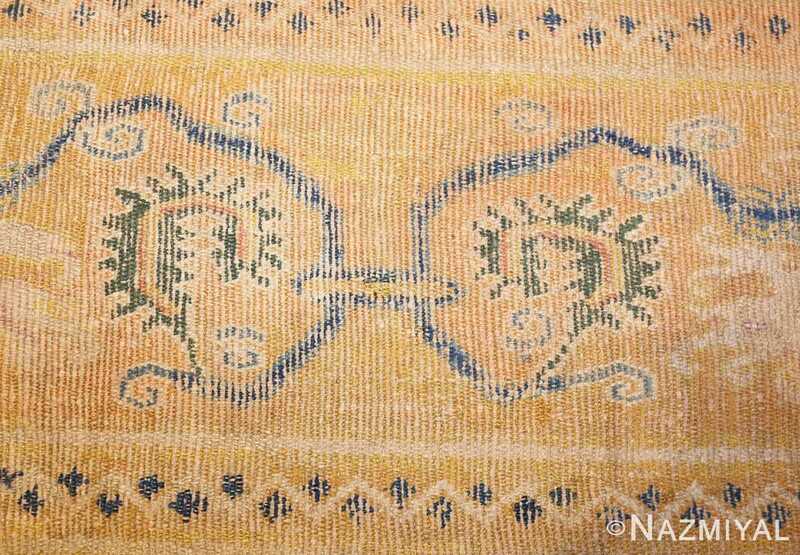 The design in the main border of the rug shows Spanish influence with its formal meandering scroll work. 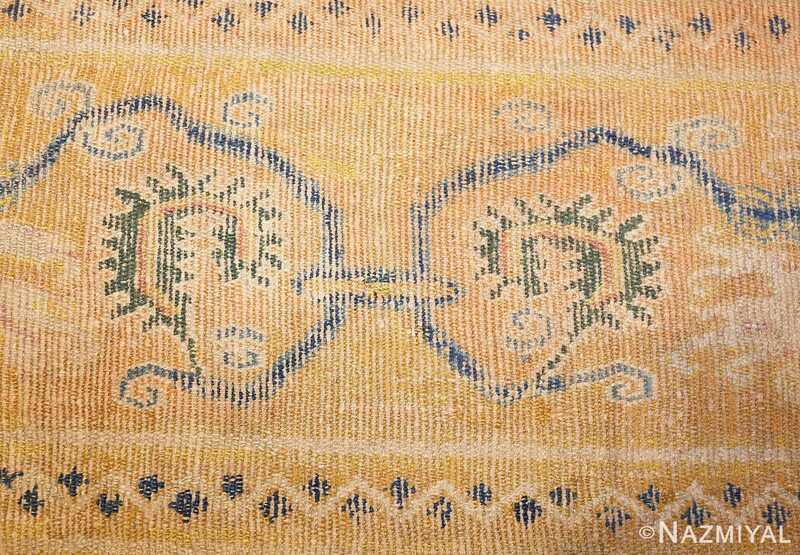 One thing of note is that these Spanish Cuenca carpets used a symmetrical rug knots, rather than the more typical Spanish knot. 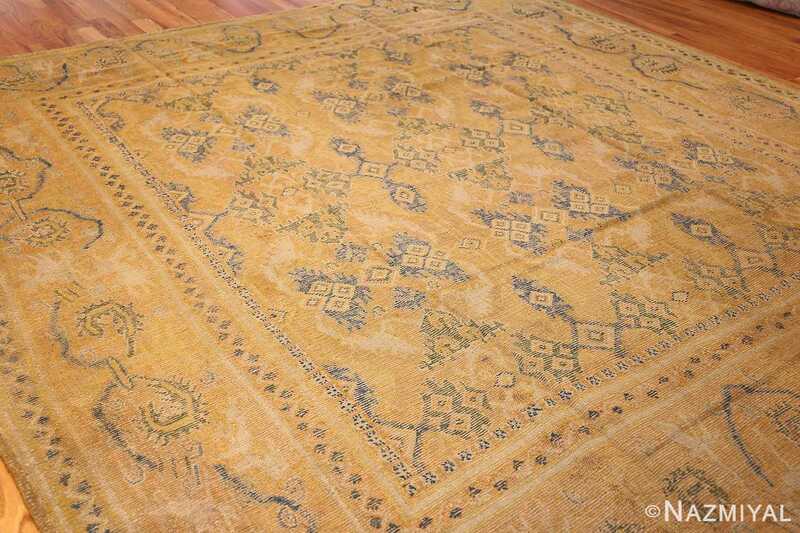 Another important thing to note is that the soft muted colors of the antique 17th Century Spanish Cuenca carpet are characteristic of the earlier antique rugs which were produced in Cuenca. 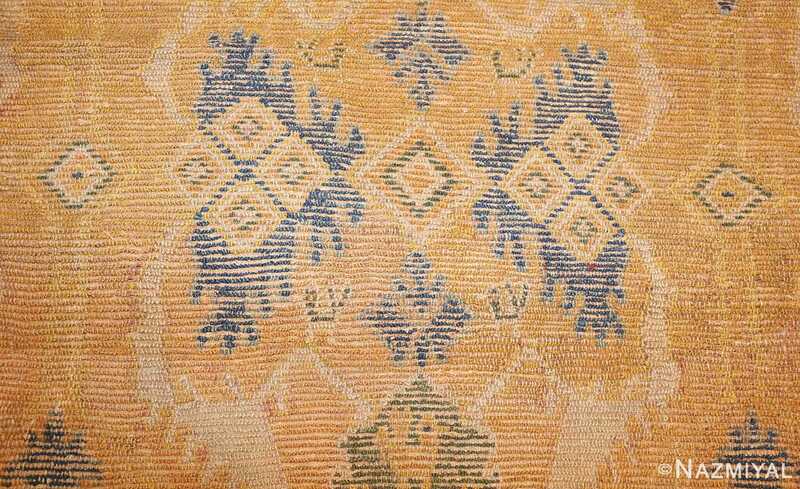 This part of the world did not have access to a wide range of color dyes as did other rug weaving centers. 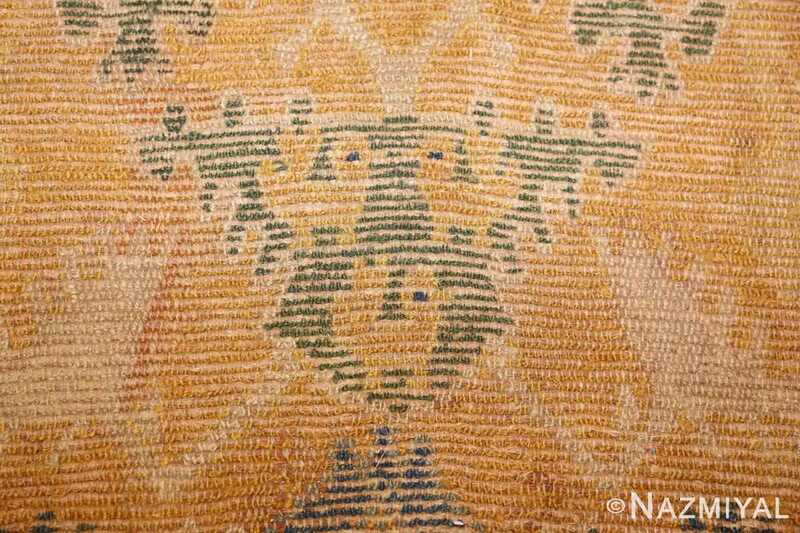 It was not until later that Cuenca rug weavers had access to brighter, more color fast carpet dyes. 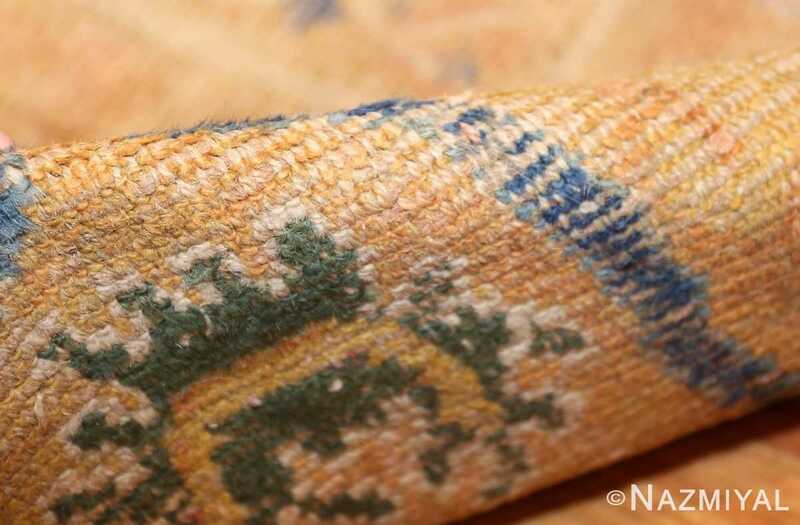 The mellowing of the colors is a characteristic of Cuenca carpets and is a sign of authenticity. This antique 17th century Spanish Cuenca carpet is a rare find and a true treasure that represents a significant time and place in world history. It clearly demonstrates the blending of Spanish and Moorish cultures. 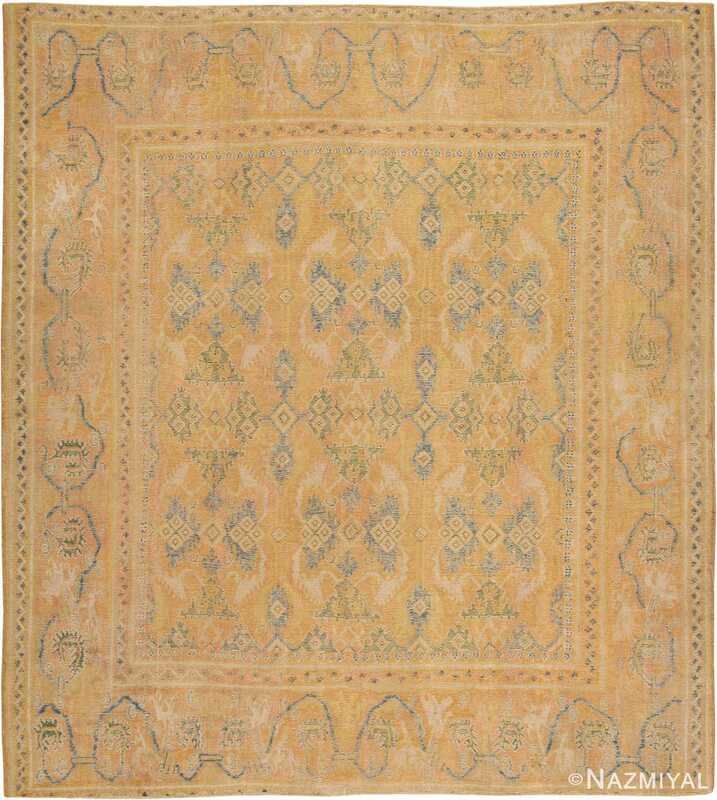 The formal structure of the antique Spanish Cuenca rug demonstrates the influence of the near eastern occupants, but it retains distinctly Spanish elements too. 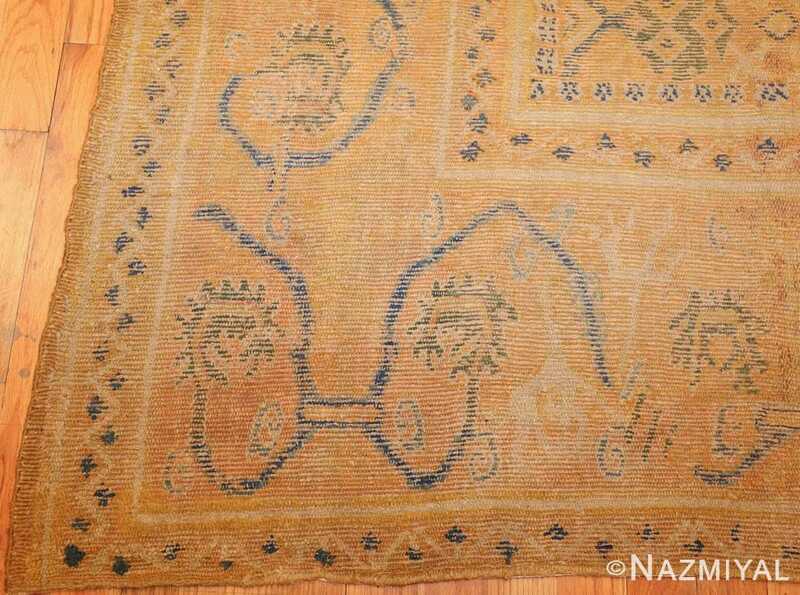 This is an important and highly collectible rug in the world of textile art and would make an excellent addition to any collection.